For the second time in a few weeks (see ‘End of Growth’ Sparks Wide Discontent), former British diplomat Alastair Crooke quotes me extensively, and I gladly return the favor. Crooke here attempts to list -some of- the difficulties Donald Trump will face in executing the -economic- measures he promised to take in his campaign. Crooke argues that, as I’ve indicated repeatedly, for instance in America is The Poisoned Chalice, the financial crisis that never ended may be one of his biggest problems. We are plainly at a pivotal moment. President-Elect Trump wants to make dramatic changes in his nation’s course. His battle cry of wanting to make “America Great Again” evokes – and almost certainly is intended to evoke – the epic American economic expansions of the Nineteenth and Twentieth centuries. Trump wants to reverse the off-shoring of American jobs; he wants to revive America’s manufacturing base; he wants to recast the terms of international trade; he wants growth; and he wants jobs in the U.S. – and he wants to turn America’s foreign policy around 180 degrees. It is an agenda that is, as it were, quite laudable. Many Americans want just this, and the transition in which we are presently in – dictated by the global elusiveness and search for growth (whatever is meant now by this term “growth”), clearly requires a different economic approach from that followed in recent decades. “Donald Trump looks very much like the ideal fit for this transition … What matters [here] is that he promises to bring back jobs to America, and that’s what the country needs … Not so they can then export their products, but to consume them at home, and sell them in the domestic market …There’s nothing wrong or negative with an American buying products made in America instead of in China. That’s Trump’s ostensible great wish, (it seems). It is not an unworthy one, but things have changed: America is no longer what it was in the Nineteenth or Twentieth centuries, neither in terms of untapped natural resources, nor societally. And nor is the rest of the world the same either. Mr. Trump rather unfortunately may find that his chief task will not be the management of this Great Re-orientation, but more prosaically, fending off the headwinds which he will face as he hauls on the tiller of the economy. In short, there is a real prospect that his ambitious economic “remake” may well be prematurely punctured by financial crisis. These headwinds will not be of his making, and for the main part, they lie beyond human agency per se. They are structural, and they are multiple. They represent the accumulation of an earlier monetary doctrine which will fetter the President-elect into a small corner from which any chosen exit will carry adverse implications. Ditto for anyone else trying to steer any ship of state in this contemporary global economy. Paradoxically – in an era moving toward greater self-sufficiency – what success Trump may have, however, will likely depend not on self-reliance so much as he would like. For his foreign policy about turn, he will depend on finding common interest with Russian President Vladimir Putin (that should not be too hard) – and for the economic “about turn” – on Trump’s ability not to confront China, but to come to some modus vivendi with President Xi (less easy). “Things are not what they were.” Complexity “theory” tells us that trying to repeat what worked earlier – in very different conditions – will likely not work if repeated later. In the Clinton era, for example, 85 percent of the U.S. population growth derived from the working-age population. The headwind that Trump will face is that, over the next eight years, 80 percent of the population growth will comprise 65+ year olds. And 65+ year olds are not a good engine of economic growth. This is not an uniquely American problem; it is a global trend too. And then there is China: It too is passing through a difficult “transition” from the old economy to an “innovative” one. It too, has an aging population and a debt problem (with a debt-to-gross domestic ratio reaching 247 percent). Trump argues that China deliberately holds down the value of its currency to gain unfair trade advantage, and he further suggests that he intends to confront the Chinese government on this key issue. “What’s good for the US in this case [the rising dollar and interest rates in anticipation of ‘Trumponomics’], is not good for emerging markets (EMs). Emerging markets benefit from a weaker dollar, and you’re not going to get that. Emerging markets benefit from global capital flows moving in their direction and that’s not happening either. Back in February, emerging markets were in sharp decline, driven by (1) a strong dollar, (2) rising US interest rates, and (3) slowing Chinese growth. Then China spurred a massive credit stimulus, the Fed became wildly dovish, and the dollar declined sharply. 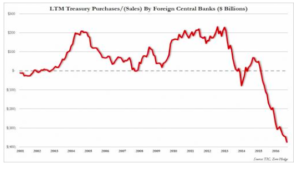 In short, Peters is saying that, with the appreciating dollar and rising interest rate environment, growth from emerging markets as a whole will falter, since emerging markets have effectively leveraged their economies to Chinese growth. 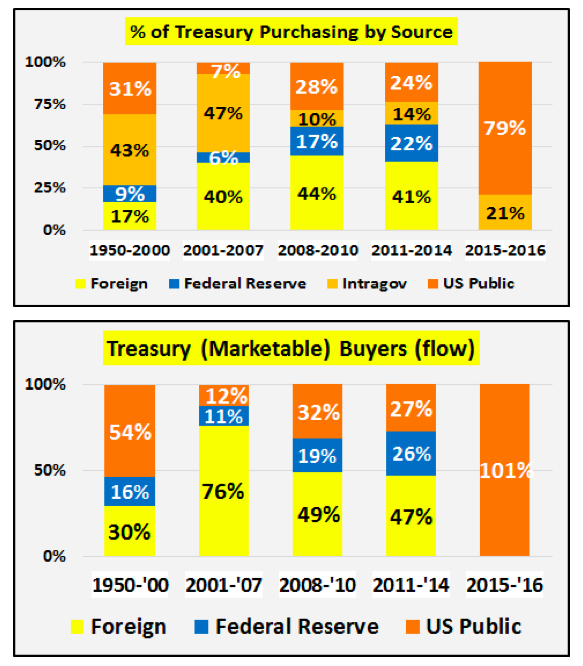 It used to be the case that they were closely tied to U.S. growth, but it is now China which dominates the EMs’ trade flows [i.e. without China growth, the EMs languish]. The question is, can America reboot its growth whilst China and the EMs languish? It is another structural shift, whereas heretofore, it was vice versa: without U.S. growth, the EMs and China languished. Now it is the converse. There are other structural changes of course which will make it harder for the industrially hollowed-out economies of the West to recuperate jobs off-shored earlier. Firstly, there has been a systemic shift of innovation and technology eastwards (often to a more skilled and better-educated workforce). This represents not only an economic event, but a redistribution of power too. In any case, technology in this new era is being more job destructive than creative. In one sense, Trump’s economic plan to “get America working again” through massive debt-financed, infrastructure projects, harks back to the Reagan era, which was also a period in which the dollar was strong. But yet again, “things today are not what they were then.” Inflation then was at 13 percent, Interest rates were around 20 percent, and crucially, the U.S. debt to GDP ratio was a mere 35 percent (compared to today’s estimate of 71.8 percent or 104.5 percent with external debt included). Then, as Jim Rickards has suggested, the strong dollar was deflationary (deliberately so), and interest rates had nowhere to go, but down. It was the beginning of the three decades’ bond boom, which finally seems to have come to an end, coincident with Trump’s election. Today, inflation has nowhere to go but up – as have interest rates – and the bond market, nowhere to go, but (perilously) down. 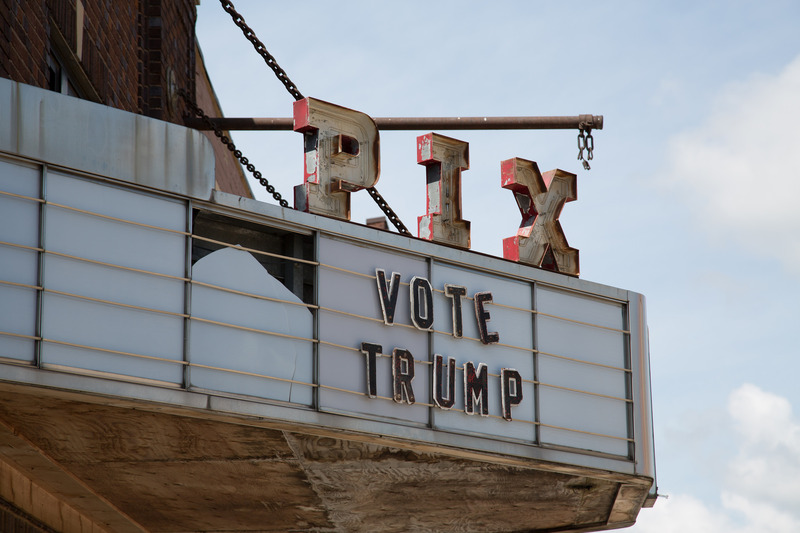 Can Trump then achieve growth and jobs through infrastructure expenditure? Well, “growth” is an ambiguous, shape-shifting term. 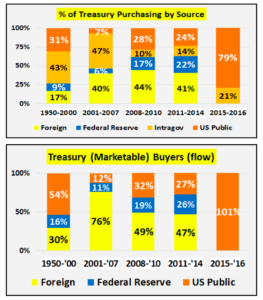 The first chart shows both sides of the equation … the annual GDP growth and the annual federal debt incurred, spent, and (thus counted as part of the growth) to achieve the purported growth. The second chart shows the annual GDP minus the annual growth in federal debt to achieve that “GDP growth.” In other words, unlike in the earlier Reagan times, more recently, the debt is producing no growth – but … well … just more debt, mostly. In fact, what the second chart is reflecting is the dilution – through money “printing” – of purchasing power: away from one entity (the American consumer), through the intermediation of the financial sector, to other entities (mostly financial entities, and to corporations buying back their own shares). This is debt deflation: the American consumer ends having less and less purchasing power (in the sense of residual discretionary income). The point here is that “growth” is becoming rarer everywhere. Russia and China, like everyone else, are in search for new sources for growth. In sum, self-sufficiency implies higher domestic costs and price rises for consumers. It is the American public who are buying. Will they be willing to take on Trump’s $1 trillion infrastructure spree? Or, will it be “printed” in yet another dilution of the American consumer’s purchasing power? The question of whether the infrastructure splurge does give growth hangs very much in the balance to such answers. (Equity shares in construction firms will do okay, of course). The bottom line: (Michael Pento, Pento Report): “If interest rates continue to rise it won’t just be bond prices that will collapse. It will be every asset that has been priced off that so called ‘risk free rate of return’ offered by sovereign debt. The painful lesson will then be learned that having a virtual zero interest rate policy for the past 90 months wasn’t at all risk free. All of the asset prices negative interest rates have so massively distorted including; corporate debt, municipal bonds, REITs, CLOs, equities, commodities, luxury cars, art, all fixed income assets and their proxies, and everything in between, will fall concurrently along with the global economy. This has major political implications. Trump is setting out to do no less than transform the economy and foreign policy of the U.S. He is doing this against a backdrop of many of the followers of the liberal élite, so angered at the election outcome, that they reject completely his electoral legitimacy (and, with the élites themselves staying mum at this rejection of the U.S. democratic process). Movements are being organized to wreck his Presidency (see here for example). If Trump does indeed experience a severe financial “unwind” at a time of such domestic anger and agitation, matters could turn quite ugly. This topic contains 7 replies, has 6 voices, and was last updated by Birdshak 2 years, 5 months ago. Trump has no plans for huge infrastructure spending. The plan such as it is are public/private ‘partnerships’ which will amount to give aways of government land and assets combined with massive tax give aways. There is no there there on the fiscal expansion. It is going to be all tax breaks, on top of other tax breaks. More deficit. That’s it. It is all rather hilarious how everyone in the alt econ world is all hot and bothered over this grand economic stimulus plan which doesn’t exist. Sorry to be difficult, but here’s another article that doesn’t mention private debt. No one ever seems to address the question of whether total debt can perpetually rise faster than total income. 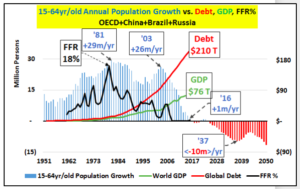 There are many that fervently believe all good things will come once total debt is reduced, but I think there’s ample evidence that such a nirvana will not happen. 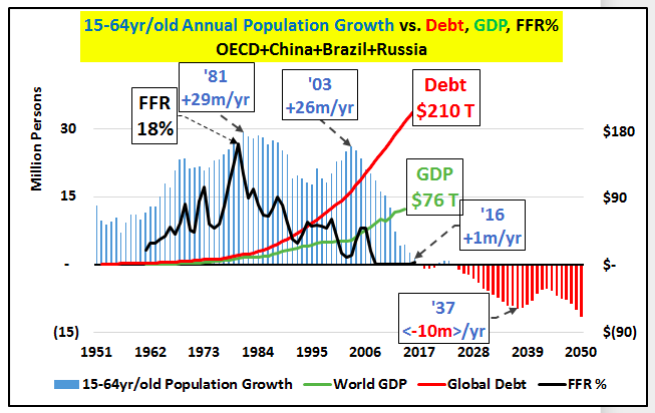 For me, how are governments going to satisfy the desire for more cars and bigger houses without more total debt? I say they won’t. The choice is between a continuation of the trend of gains in debt exceeding gains in income or a much simpler society. It’s nothing more than that. The debt is never going to be repaid because it can’t. It was never meant to be. The plan since 1970 was to abuse it as much as possible, then default and swap to a new system. So, no, debt can’t rise faster than income, but no one cares. It was always meant to fail. Trump is no exception to this rule, and we can all agrue about whether he can get better negotiating terms in the upcoming bankruptcy. But time is up. Dow over 19,000. See what a great leader we have elected! I’m selling all my stocks. Don’t be hasty: they handed him the economy wired to explode. We’ve got the largest bond dislocations in 30 years already and emerging markets hammered. Since bonds are 10x larger than stocks, money fleeing bonds could drive stocks to dizzying heights. Add that they won’t rush into EM, China, or the EU, and you have a recipe for dizzying heights for US Stocks — but only the core DOW, S&P, as the economy here is dead. But wait! That’s not all! With the US$ rising as the core currency, and China, India, being unsafe, with the EU about to Italeave, money should rush into any US assets, US$, driving it higher still. Sound great? It’s not! It’s called massive Deflation. The US$ rises and rises until the US cracks under the strain and defaults, or the world cracks under the strain and rejects the US$ as core currency. So translation: you ain’t seen crazy yet. Thank you, Doctor. I wish I had the financial acumen some of you guys enjoy. Only thing I know is grazing dairy cows.